Some of us have been misinformed about what it takes to succeed. We were taught to work hard, never give up, and pay our dues with blood, sweat and tears in order to get what we want. And lots of us have been practicing that – slowly but surely driving ourselves into a state of overwhelm and exhaustion. It turns out that was bad advice. Because working hard for what you want doesn’t actually work that well. It’s unreliable, it’s a long road there, and it isn’t much fun. Not to mention we we wear ourselves – physically and emotionally – in the process. It’s called Slacker Manifesting: the art of chilling out to get what you want. If you’ve been driving yourself to exhaustion without getting the results you really want, this book is for you. 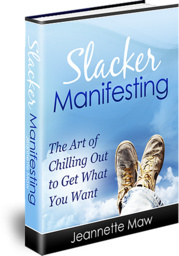 It covers what slacker manifesting is, why it makes all the difference in dreams coming true, and how to practice it. But don’t some things HAVE to be done? Isn’t anything worth having worth working hard for? Others will think I’m lazy. It sounds too good to be true (that doing less results in more). I don’t have the freedom to practice this. It also includes slacking success stories in a variety of areas of life, including weight loss, a cancer cure, a financial windfall, gaining new skills, knocking out to do lists, finding a lost dog, and more. It also comes with an hour long recorded call on Slacker Manifesting hosted by Kristen Howe of Manifest Everything Now. and for people who might understand (theoretically) that working harder doesn’t work – but have a hard time trusting and practicing it. The reality is many of us are trying very hard to create what we want, not realizing that trying hard actually keeps us from the happy ending we want. So if you’re curious about another alternative; if you’d like to let go of the struggle; if you suspect there’s more to life than you’re experiencing; and if you would like to investigate a way to enjoy the journey while STILL getting the goods, this book is for you. 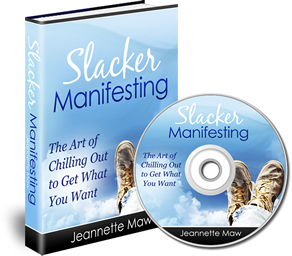 Before you download, let me say this: Slacker Manifesting is not for sissies. We don’t turn to slacking because we’re lazy, unmotivated, or don’t have big dreams. We slack because it is the most effective, most direct course to get what we want. Slacking your way to success requires a willingness to drop old habits, to ignore the opinion of those around you still doing things the old way, and to consciously restructure your beliefs. But the rewards are well worth it. And if you’ve already read it, I’d love to hear your thoughts and experiences here on the Slacker facebook page. My sincere thanks for playing with a new way of getting what you want. The world will be a more more satisfied and happier place because of you and your slacker ways!